Thanks to the efforts of more than 260 students and staff, Syracuse University raised $5,000 for the United Way of Central New York during the 12th annual Dollar Day at the Dome on Saturday, Nov. 6. Members from the five Greek councils (Interfraternity, Multicultural Greek, National Association of Latino Fraternal Organizations, National Pan-Hellenic and Panhellenic), a Greek service organization, staff and their family members braved the cold morning temperatures to collect donations at 60 locations around campus. Funds raised benefit more than 100 programs at 39 Central New York agencies. SU is in the midst of its 2010 United Way campaign, “Live United,” which runs through Dec. 10. Upcoming campus special events include silent auctions, bake and soup sales, used book/video/DVD sales, an International Thanksgiving Feast, bowling party and craft shows. 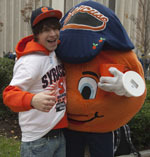 Last year, SU raised $200,000 through campus participation in the campaign. For more information on events, or the “Live United” campaign, contact Margie Johnson in the Office of Human Resources at 443-4224.